How do great managers cultivate excellent performances so consistently? Sometimes it’s about moving a star into a supporting role. 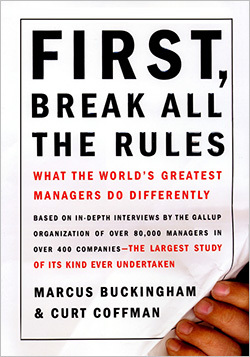 We continue our Leadership Hall of Fame series, a year-long look at the top business books and authors, with an excerpt from First, Break All the Rules (1999) by Marcus Buckingham and Curt Coffman. person so that you are paying her to do what she is naturally wired to do. You have to cast her in the right role. had Paul Newman playing Sundance and Robert Redford as Butch. gave this classic film an appeal it might otherwise have lacked. what matters is what is inside the person, not physical prowess or appearance. accounting backgrounds are siphoned off into the finance department. top of that list, you will always run the risk of mediocre performance. of people. You have no idea whether these people have talent or not. way they all interact, who supports who, and why. They notice things. each person’s talents is to watch his or her behavior over time. strengths and turn talent into performance. way out the door. If he didn’t jump, he would soon be pushed. was when he was working for a supervisor who paid attention to him. then the supervisor moved on to a new role, and John’s light dimmed. Guided by that one glimpse, Mandy put John into the “movers” category. people, to learn their names, to remember special things about them. the clients stayed clients, and the prospects soon joined them. John was in his element, using his natural strengths to everyone’s advantage. When Mandy tells this story you can hear a little catch in her throat. turn John’s talents into performance. find that “something.” The trick is in the casting. Reprinted from First, Break All the Rules by Marcus Buckingham and Curt Coffman. Copyright © 1999 by The Gallup Organization. Published by Simon & Schuster, Inc. Reprinted by permission. Read more about First, Break All the Rules or our Leadership Hall of Fame.